Adults can have up to four wisdom teeth, two in the upper and lower jaw respectively. Wisdom teeth, also known as third molars, are the last teeth to erupt in your mouth. This generally occurs between the ages of 17 and 25. The wisdom teeth are the last to erupt and are right at the back of the oral cavity. Sometimes the wisdom tooth does not erupt in the correct position due to a lack of space. The tooth becomes impacted and its' growth and eruption are prevented by overlying gum, bone or adjacent tooth (second molar). A wisdom tooth may be partially impacted, which means a portion of it has broken through the gum, or totally impacted and unable to break through the gum at all. 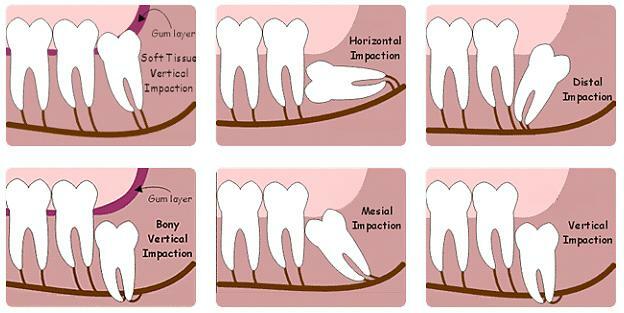 Impacted and partially impacted wisdom teeth can be painful and lead to infection. They may also cause crowding or damage adjacent teeth or roots. Commonly, braces are used to straighten teeth and produce a fuller dental arch. This results in not enough space for the wisdom teeth to erupt, thereby creating a myriad of potential problems. When this occurs, wisdom teeth can be removed under a Local or General anaesthetic. The choice depends on the severity of the impaction, the number of teeth requiring removal and of course the patient’s preference and financial status. Dr Webber is happy to discuss all of the above at the time of consultation to ensure the most appropriate and comfortable plan is arranged. Dr W ebber is a highly skilled and trained Specialist Surgeon. He is able to use the most modern and minimally invasive techniques to ensure as little swelling, discomfort and risk as possible.The cost of removal will depend on the difficulty of the surgical case. Surgery can be performed under Local or General Anaesthetic depending on a particular patients' clinical and financial circumstances. His fees are highly competitive despite his Specialist Surgical Qualification. Generally the price will vary between $350 - $550 per tooth depending on the complexity of the treatment required. Please contact our office for further information. The risks of any surgery can be minimised by consulting, and subsequently being treated, by a Specialist in that particular field of surgery. Being a Specialist Oral and Maxillofacial Surgeon, Dr Webber will provide a full and detailed explanation of your specific surgical situation at the initial consultation. Where can my surgery be performed? Dr Webber is accredited at various Hospitals and Day Surgeries on the Gold Coast and Northern Rivers, New South Wales. Surgery can be performed at all locations under a General Anaesthetic (asleep) and under a Local Anaesthetic (awake) in our Pindara Specialist Suites (Gold Coast) consulting rooms. Dr Webber performs General Anaesthetics at Pindara Hospital & Day Procedure Centre (Gold Coast, QLD), Tweed Day Surgery (Tweed Heads, NSW) and Ballina Day Surgery (Ballina, NSW). If you are having a general anaesthetic ("asleep" in a hospital or day surgery centre), you will need to fast (nothing to eat or drink) for 6 hours prior to your procedure. You will be in hospital for about 3 hours in total (including admission, surgery and discharge) and will require someone to pick you up from the hospital and care for you for 24 hours after the surgery. If you are having a Local Anaesthetic ("awake" in our consultation rooms in combination with nitrous oxide "happy gas") we recommend you have something to eat prior to your procedure. You can drive yourself home afterwards.